The fires outside aren’t the only flames that firefighters and steelworkers must deal with everyday–the high heat can pass through their outer protective layers and burn through their cotton undergarments. That’s why Swedish underwear maker Björn Borg developed Thunderwear, a line of flame-proof underwear for men and women to protect them from the dangerous sparks. Björn Borg teamed up with the European Space Agency to make the Thunderwear garments from Nomex, a fire-resistant textile used in spacesuits. The fires outside aren't the only flames that firefighters and steelworkers must deal with everyday--the high heat can pass through their outer protective layers and burn through their cotton undergarments. That's why Swedish underwear maker Björn Borg developed Thunderwear, a line of flame-proof underwear for men and women to protect them from the dangerous sparks. 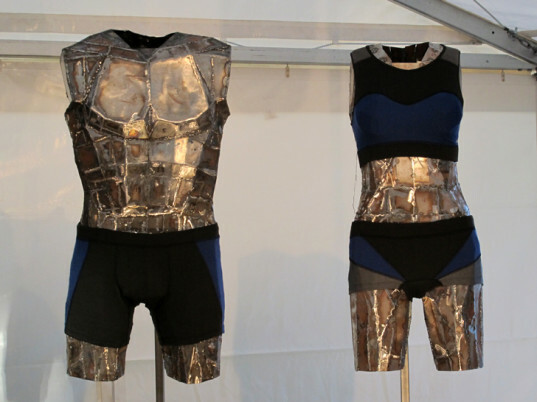 Björn Borg teamed up with the European Space Agency to make the Thunderwear garments from Nomex, a fire-resistant textile used in spacesuits.